Is it too much to expect increased transparency and integrity in the Brave New World of the Uncle Sam economy? 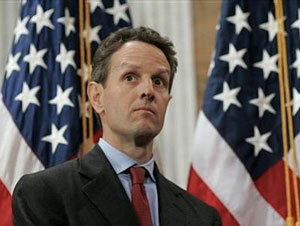 Don’t expect to get a ‘direct’ answer from Turbo-Tim Geithner. Why? Geithner just redefined ‘indirect’ buying in our U.S. Treasury auction process without a hint that this major piece of information was even up for review. Let’s look deeper into this sleight of hand. The Wall Street Journal sheds a little bit of light on this development in, Is Foreign Demand as Solid as It Looks? The sudden increase in demand by foreign buyers for Treasurys, hailed as proof that the world’s central banks are still willing to help absorb the avalanche of supply, mightn’t be all that it seems. When the government sells bonds, traders typically look at a group of buyers called indirect bidders, which includes foreign central banks, to divine overseas demand for U.S. debt. That demand has been rising recently, giving comfort to investors that foreign buyers will continue to finance the U.S.’s budget deficit. But in a little-noticed switch on June 1, the Treasury changed the way it accounts for indirect bids, putting more buyers under that umbrella and boosting the portion of recent Treasury sales that the market perceived were being bought by foreigners. Why is this development so meaningful? Very simply, as the United States deficit explodes and Treasury auctions skyrocket, our funding needs will increase accordingly. With BRIC nations (Brazil, Russia, India and China) threatening to purchase fewer Treasuries – if not outright sell our debt going forward – we become ever more dependent on finding other outlets for our bonds. If ‘indirect’ buyers, that is foreign entities, purchase fewer Treasuries, then it is not a stretch to envision our interest rates moving higher to attract other buyers. Rather than waiting for a potentially unpleasant development, Geithner appears to have proactively used some artifice in redefining ‘indirect’ buyers to include not only foreign entities but also domestic buyers who place orders to purchase Treasuries through a primary dealer. By broadening the definition, Geithner and team are able to disguise the true level of foreign buying. When questioned on this redefinition, how did Tim respond? Treasury officials didn’t respond to requests for comment. So much for increased transparency and integrity. Why should we be surprised? Although healthy markets love transparency and integrity, tax cheats are not typically fond of these principles.